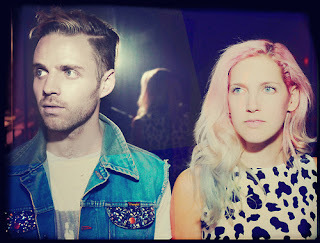 SnapCacklePop: MS MR are our indie electro pop Fantasy..! MS MR are our indie electro pop Fantasy..! After appearing at Sydney’s Laneway festival at the weekend and their sold out side-shows in Sydney and Melbourne alt-pop duo MS MR (Lizzy Plapinger and Max Hershenow) are wowing the crowds with their new blend of indie, soul electronic pop whetting appetites for their debut record Second Hand Repture on 10 May. After hitting the #1 most played spot at triple j just a couple of short weeks ago, the video for their newest single Fantasy debuted this week and it’s a cracker. Taken from their forthcoming debut LP, produced by Max and Tom Elmhirst and comprises 12 tracks including this new song and debut single Hurricane. We are catching up with the pop-duo this week for a chat, however until you get to read our interview, check out their new track of a band that is definitely ones to watch..!